Fakes are in the air. Or, to put it in a language that the curators reading this article will find easier to understand, issues of authenticity, appropriation and signatory value are currently the locus of prevalent international inquiry. And I mean prevalent. Just last week that previously august institution the Fitzwilliam Museum in Cambridge announced with great drama that a pair of pretty Renaissance bronzes in its care were no longer the work of Mr A Nonymous, as had previously been believed, but were thought to be from the hand of the divine Michelangelo. Wow! Overnight, a pair of decorative bronzes previously worth a million were propelled deep into the priceless zone. In Switzerland barely a week goes by without some new Leonardo being discovered sulking in the bank vaults, surrounded by political donations. Most recently a long-lost portrait of Isabella d’Este, worth £100m they say, was freed at last from the Swiss vaults by the Italian police. In Italy itself the putative Leonardo drawing they call La Bella Principessa, also discovered a few years ago, is currently ignoring the doubters on a triumphal tour of Umbria. It is against this backcloth that the Dulwich Picture Gallery, the sweetest gallery in south London, has come up with the excellent wheeze of deliberately swapping one of its Old Masters for a fake, putting that ringer in the real picture’s frame, and inviting us along to spot the difference. 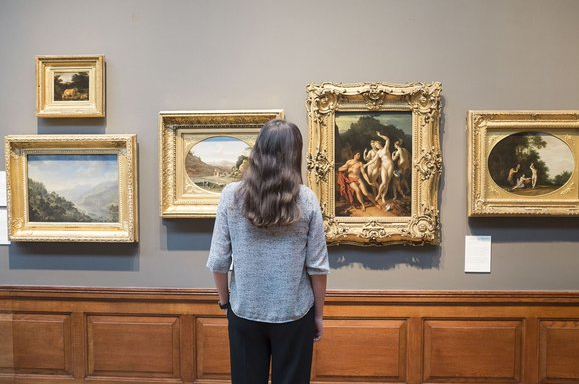 The idea is that you turn up, stroll studiously among the 270 paintings on display, by Rembrandt, Rubens, Poussin et al, and decide which of them is a copy. In April, at a grand unveiling, the two pictures, the fake and the original, will be hung side by side, proving you right or wrong. To add yet more contemporary relevance to the wheeze, the fake itself has been made in China, by the Meisheng Oil Painting Manufacture Co Ltd, an internet-based reproduction service, located in Xiamen, that employs 150 highly trained professional artists to produce copies of whatever you send them. If you want the Mona Lisa, they’ll make her for you. If you need a Laughing Cavalier, ask the Meisheng Oil Painting Manufacture Co Ltd. There are different prices for different sizes of picture, and different quality grades, with “museum quality” at the top. Dulwich went for one of those. All it had to do was send over a high-resolution photograph and a team of eager Chinese Leonardos set about repainting it. So how well did they do? Better than they should have, would be my honest answer. I turned up at the gallery positively bursting with confidence that I would immediately spot the deliberate Chinese fake. But that didn’t happen. The chief problem was that, in my anxiety not to get egg on my face — the art critic who got it wrong — I overthought the situation. What would Chinese fakers be particularly good at, I wondered. Flower paintings seemed the answer. They’d be good at minutely copying highly detailed flower paintings. 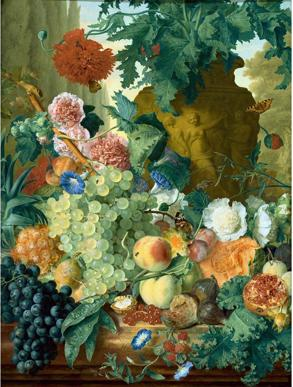 As it happens, Dulwich Picture Gallery has a couple of corkers in that field, a pair of colourful bouquets by Jan Van Huysum (1682-1749), painted so minutely they might almost be, er, reproductions. Unfortunately, the room in which they hang, the Rembrandt room, was occupied by a pair of restorers when I went, noisily photographing an interior by Rembrandt’s pupil Gerrit Dou (1613-75) that they had placed right in front of the Van Huysums. So I couldn’t get near them. Suspicious or what! Dulwich is England’s oldest public art gallery, opened in 1817 and designed by Sir John Soane with a pioneering system of top lighting that is admired by architectural purists the world over. The trouble with top lighting, however, is that it depends on the sun actually shining, something that cannot be guaranteed in south London in February. From a distance, through the murk, Van Dyck’s portrait of Venetia Stanley, Lady Digby, on her deathbed looked eminently wrong. What a strange picture. Isn’t that too wonky for Van Dyck (1599-1641)? As for that Fragonard over there, the battered female face that looks as if it has been tumble-dried in a launderette, what could have possessed this great speedster of the rococo to paint his portrait on the back of the canvas, the rough side? I know Gauguin used to do it, and Van Gogh, but Fragonard (1732-1806)? Nothing was making sense. And that’s the trouble with looking this closely at art. Everything looks suspicious. Nothing looks right. By the time I left the gallery that afternoon I was of a mind that of the 270 pictures I had seen, about 270 were not as I expected them to be. It wasn’t till I got home and left the decision entirely to my instincts that the true identity of the fake became clear to me. Ah. So that was it! The artist who came up with this entire wheeze, Doug Fishbone — which he claims is his real name, though in this context it sounds pretty dodgy to me — has explained that his project is about “focus, attention, mindfulness”. Which is true. But let’s not kid ourselves, it’s also about money. Indeed, it may principally be about money. La Bella Principessa was acquired at auction as a work by a German 19th-century master for $21,850. Now she is said to be worth $160m. She’s the same picture. Nothing about her has physically changed. But where before you might amble up to her and think, “Nice drawing”, now you have to push your way through the crowds before gasping: “OMG, it’s Leonardo!” And that is a very different experience. As for the Dulwich fake, here’s a cryptic clue: the Japanese pitcher resists your touch. Easy-peasy.